A combination of booth seating, settees and mobile folding tables give this room a lot of multi-purpose usabilities. Tigers lurking at you from all over the room. Colorful neon jukebox sets the sound level in the room — kids don’t talk over the music level set by the administration. 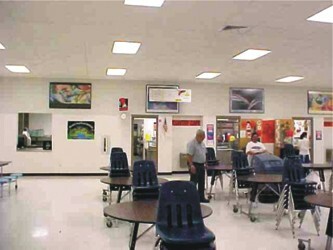 Before: Pretty standard cafeteria furniture with some art on the walls — actually, more interesting than most dining rooms. 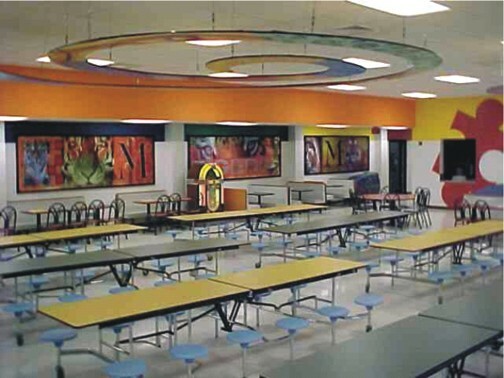 After: A colorful painting scheme designed by our artists, a ceiling hung swirl décor piece and vivid wall art. Now you can tell they are the Tigers!